I've always taken wheelbarrows for granted, and that, I learned today, was my mistake. 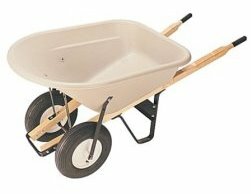 Reading Consumer Reports and scouring the wheelbarrow reviews on Amazon, I learned that there are a lot of poorly designed wheelbarrows out there. Lightweight plastic ones that crack; one-wheeled barrows that tip over under heavy loads. And, the case of our old metal hardware store wheelbarrow, ones with wheels that explode. With the wheel still firmly attached to the wheelbarrow, I relinquished my grip on the wrenches and I went inside to do some online research. It was not as conclusive as I'd hoped. One of Consumer Reports' top three wheelbarrows was roundly slammed by five irate buyers on Amazon. All five gave it the lowest possible rating, and one seething review concluded: "After two months with no response from the manufacturer, I left it at the curb for the trash pickup." How can a wheelbarrow get this complicated? Still haunted by the wheelbarrow experience, I headed down to the basement tonight to see about assembling the little 20" glass occasional table I bought for my mom's condo balcony. I unpacked it and discovered that you just pop the legs into little plastic braces under the table; no screws, no bolts, no nuts, no fuss. Divine. I wonder if they make wheelbarrows.